Thursday morning keynote speaker Kathleen Diamantakis, Managing Director of Strategy for T Brand Studio, The New York Times’ in-house brand marketing unit, highlighted the increasing importance for marketers to create socially meaningful content to promote their brands, especially in a world where the abundance of content has overwhelmed and numbed target audiences. As an example of that meaningful work, Diamantakis called out Philips’ short film, The Longest Night, an Icelandic fisherman’s tale of long days at sea followed by sleepless nights, and what the company is doing to combat sleep disorders, which nearly half of Icelandic fishermen experience. 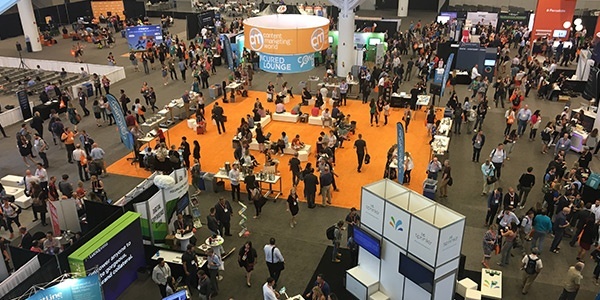 In a second Thursday morning keynote presentation, Jane Weedon, Director of Business Development for streaming service Twitch, shared how the platform’s brand of audience participation and partnership with content creators has led to more than 15 million daily visitors and 355 billion minutes of content watched in 2017. What makes Twitch different than other platforms, Weedon said: entertaining long-form video content that’s streamed live, shared and that is energized by real-time interaction between creators and their followers. She also described a phenomenon she called “the Flywheel Effect,” the viral response to the platform’s first content marathon in 2015, a nine-day streaming of Bob Ross’ The Joy of Painting episodes. The marathon inspired a community of broadcasters to stream their work on Twitch, Weedon said. Allen Gannett, CEO of TrackMaven led a session about growing LinkedIn video views from zero to 1 million in his presentation, “Winning with LInkedIn Video.” Gannett said there’s a great deal of organic opportunity for this type of content at the moment, which marketers should take advantage of. Some tips for success: focus on original topics that aren’t too far out, keep posts under 90 seconds, mix videos up with photos, links and long-form content, and for better engagement, post video natively instead of sharing YouTube links. 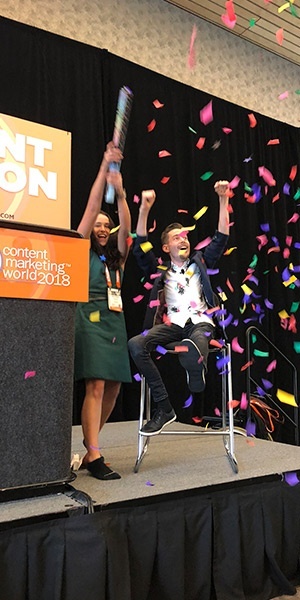 In a keynote session on How Long-Form Content Beats Snaps, Tweets, and Chatbots, panelists Dorie Clark and Ann Handley shared observations on why long-form content isn’t dead. Among the revelations: that 62% of marketers are using longform content and about 56% of bloggers report “strong results” from posts that are 2,000 or more words. In a different session, marketers from Vengreso echoed their findings, reporting five to ten times more visibility on long-form LinkedIn posts (of around 1,300 characters) that don’t include links. Ahava Leibtag, president of AHA Media Group LLC, in her presentation, offered how-to advice for content creators, gleaned from master songwriters. At the core of their success, she said, embracing three key elements: exposition, conflict and resolution, to create the most engaging stories. Along with this, Leibtag also lauded the benefits of team writing. She shared examples of these practices too, with videos recounting Taylor Swift’s writing process for the song Delicate and Jackson Browne’s collaboration with Glenn Frey to complete the lyrics for Take It Easy. A session on Nightmare Marketing: How to Create Content for the Boring, Complex and Undifferentiated Stuff, spotlighted presenter Jonathan Kranz of Kranz Communications sharing his advice on how to make B2B content more memorable. For “boring” products, for example, he recommended playing up the consequences of a world without that product, highlighting the concerns of the target audience who cares about this product, and/or tying messaging back to real-world events, news stories or trends. A prime example he shared: an engaging case study focusing on the runup events, maintenance issues and costs that led one apartment community to update its boiler units. Capping the conference was a keynote discussion with actress, comedian, writer and producer Tina Fey who sat down with Stephanie Stahl of Content Marketing Institute for a lighthearted question-and-answer session. Fey shared a look into her creative process, along with the observation that great content can come from anywhere. Fey said she wouldn’t be surprised, for example, if the next great video content or series was something only available in a Happy Meal.